You know that students just love homework, and with Google Classroom, you, as the teacher, can quickly make assignments that include attached materials. After you post the assignment, your students receive an e-mail notification of the assignment, after which they complete it and turn it back in. The cool thing is that, after students turn in the assignment, they lose edit access for that assignment, which means they can’t change it. You can then grade the assignment. Google Drive: This option also attaches a file to the assignment, but takes you right to your Google Drive to find the file. Make a copy for each student: Choose this option if you want each student to have his or her own copy of the assignment. Students can make changes and turn in the assignment separately. This is best for typical homework assignments in which the student is responsible for his or her own work. When you’re finished, your assignment may look something like Figure 1. Click Assign. The assignment is made, and each student receives an e-mail notification of the assignment. The assignment shows up on the class’s Stream page, where you can monitor how many students have completed the assignment. Although you can certainly upload files created in non-Google applications, such as Microsoft Word, it’s better to use Google Drive’s applications for creating documents if you’re going to be sharing them in this way. 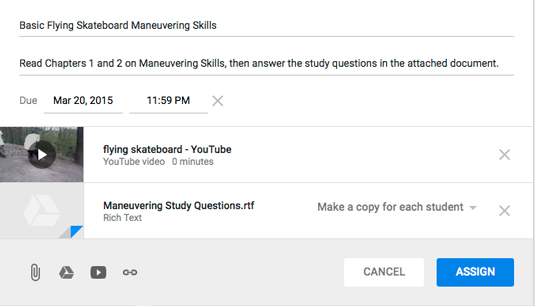 Google Docs, Sheets, and so on, are fully integrated into Classroom, and your students won’t have to jump through hoops when completing their assignments. For example, if you upload a Microsoft Word document, the student has to download the document to complete it, re-upload it when completed, and reattach it to the assignment. Or they have to open the file in Google Docs to complete it and reattach it to the assignment. Creating the document in Google Docs to begin with eliminates most of those steps. At the bottom of the assignment on the Stream page, teachers and students can comment on the assignment. You can provide additional explanations here, or students can give general comments about the assignment or ask questions, which are visible to all of the other students. Figure 1: Make an assignment to your class.